WE’RE HIRING! YOUR CHANCE TO JOIN AN AWARD-WINNING TEAM. Welden & Coluccio Lawyers is an industry-leading wills and estates practice (Doyle’s Guide 2016/17) that is seeking to expand its award-winning team through the addition of a senior lawyer. This is an opportunity to cement your reputation as a wills and estates specialist in a fast-growing, innovative, family-friendly law firm. 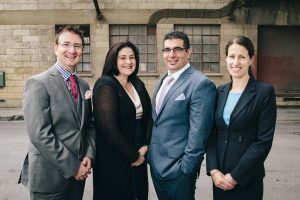 Established in 2014, Welden & Coluccio has quickly grown into a respected practice that leads – and embraces – change in the way wills and estate law is delivered to South Australians. With a focus on quality service delivery, leadership in community education and practical outcomes for our clients, Welden & Coluccio Lawyers has offices in Prospect and Flinders Park, with outreach consultancies in the Barossa, Fleurieu and Upper Spencer Gulf. Telstra Business Awards finalists in 2016 and 2017, in August 2018 the practice takes its next important step as it moves into its purpose-built offices on Grange Road. You are a wills and estates specialist with more than five years post-admission experience, keen to take the next step in your career and plant your flag in a firm that is growing, sustainable and values people and the relationships it shares with its clients. You are dedicated, ethical, hard-working and able to bring a client-base with you to hit the ground running. In return you’ll work for a firm that values people and embraces change that delivers a better outcome for clients and its staff. In addition to working in a tight-knit, friendly team, a competitive remuneration package is on offer, and we are happy to negotiate for the right candidate. Some family law experience is desirable. For a confidential discussion, please contact Jason Coluccio – practice principal. Applications should be sent in PDF format to jon@welcolawyers.com.au by COB June 29.